Second Grade Signpost: A Capacity Conversion Make and Take! This was just too cute and too perfect not to share with you all. I'm linking up with Cynthia over at Second Grade Pad for her Make It and Take It Linky. My class and I are working on measurement, specifically capacity. There are so many numbers to remember when converting from gallons to cups, pints to quarts, as so on. So every year we make a Gary Gallon or a Gabby Gallon. Of course, the girls in the class make Gabby and the boys make Gary. I got the adorable bunny graphics from Melonheadz. So I made a quick practice page to go along with our conversion crafts. 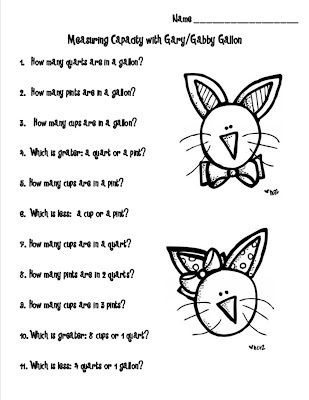 Just click on the worksheet to get the worksheet, graphics and directions to make your very own Gary or Gabby Gallon! Here are some pics of my students using their Garys or Gabbys. These are adorable! Thank you so much for sharing the idea. I love the bunnies!! What an adorable idea! Thanks for sharing! I love the Garys and Gabbys! Thanks for sharing!! Thanks, Ladies! I appreciate the feedback!